You must be a member of the Toronto After-Work Drinks Group to attend this activity. Would you like to join this group? Let’s hang out at a musical underwater adventure! Live Jazz music paired with cash bars located throughout the aquarium. Tickets can be bought online - be sure to choose March 8th . Sonny Balcones is a 30s & 40s swing jazz group. 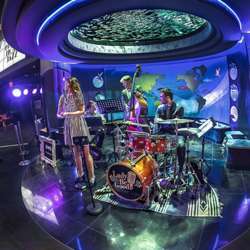 You get the full aquarium experience at a discounted price during Friday Night Jazz and Jazz can be heard throughout the aquarium through their speaker system. The live band is set up in the discovery area. If you love the evening - you can upgrade before you leave to an annual pass and get monthly jazz nights and other events free with an annual membership!